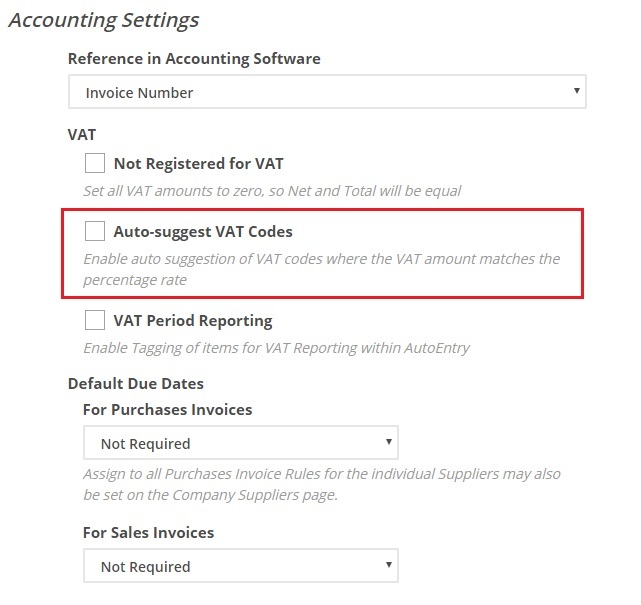 With the Auto-Suggest VAT Codes feature in company settings you can tell AutoEntry your preferred VAT codes for a specific VAT rate that AutoEntry will automatically populate the VAT Code drop-down. This will mean that for new suppliers/vendors or for suppliers that have not have had codes remembered for them, AutoEntry will populate your preferred rate into the VAT code drop-down for you, saving an extra column you need to select. Especially handy for Sales invoices whereby it's generally the same VAT code you use for all sales. You can add as many VAT codes as you with although there can only be one preferred code per VAT rate. Don't worry, if a particular invoice needs a different VAT code applied, you can change the selection at any stage before publishing.